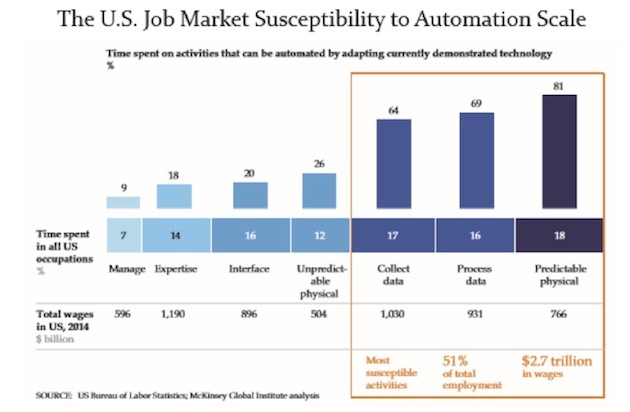 Right now, automation tops the list of things that might threaten our jobs. Artificial intelligence and robotics technology are rapidly learning to do what human workers do, but better, faster, and cheaper. I’ve use the following chart before, but it’s a compelling illustration of how technology is reducing employment. 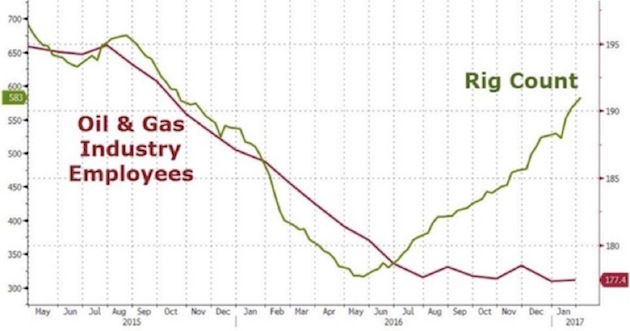 It shows the rising rig count in the oil patch since mid-2016 – and yet the number of workers on those rigs is actually still falling. This is the impact of a new robot called an iron roughneck: Tasks that used to require 20 people now need only five. And the iron roughneck is not even that widely deployed in the oil and gas industry – the trend will hit hard in the coming decade. Roughneck jobs are relatively high-paying; it takes a great deal of training and skill to be able to do them. Today I’ll give you some quick thoughts on the just-issued November jobs report, then take a deeper look at the automation problem/opportunity. I use both words because automation truly can be either. And then we look at the failure of the Federal Open Market Committee (FOMC) to take into account the major technological changes that are going to come our way over the next 10 to 12 years (if a host of studies are correct). I think that failure is likely to lead the FOMC to make the mother of all policy errors. And right now, a major monetary policy error is the most dangerous weapon of mass wealth destruction facing the US and the world. Before we go on, let me briefly remind you that our Mauldin Economics VIP Program is open until December 13. VIP is our “all you can eat” package. For one low price, you get all our premium investment services and a few extra benefits as well. I believe our information will be invaluable as we move into a highly uncertain 2018. You can learn more about the VIP program here. The jobs report for November was solid, with job growth above the recent average. Employers added 228,000 jobs in November, 221,000 of them in the private sector. Both are nicely above their averages over the last six months, 164,000 headline and 162,000 private. Almost all the major sectors and subsectors were positive. Mining and logging was up 7,000 (slightly above the average for the last year); construction, 24,000 (well above average, with specialty trades strong and civil/heavy down); manufacturing 31,000 (well above average, with almost all of it from durables); wholesale trade, 3,000 (slightly below average); retail, 19,000 (vs. an average loss of 2,000); transportation and warehousing, 11,000 (well above average); finance, 8,000 (weaker than average); professional and business services, 46,000 (right on its average, with temp firms particularly strong); education and health, 54,000 (well above average, with education, health care, and social assistance all participating); and leisure and hospitality, 14,000 (well below average). The only major down sector was information, off 4,000, slightly less negative than average. Government added 7,000, well above average, with local leading the way. Also, we must smooth out all the post storm disruptions. This give us a 3-month average monthly job gain of 170k, a 6-month average of 178k, and a year-to-date average of 174k. These numbers compare with average job growth of 187k in 2016, 226k in 2015, and 250k in 2014. Again, the slowdown in job creation is a natural outgrowth of the stage of the economic cycle we are in where it gets more and more difficult finding the right supply of labor. The growth in wages is also decelerating. I was talking with Lacy Hunt this morning about the jobs report. He noted that real wage growth for the year ending November 2015 was 2.8%, while for the year ending November 2016 it was just 1%. The savings rate is now the lowest in 10 years. The velocity of money is still slowing, which means that businesses have to do everything they can to hold down costs, and one of those things is to rein in wages. And yet the Federal Reserve has a fetish for this thing called the Phillips curve, a theory that was thoroughly debunked by Milton Friedman early on and later by numerous other economists as having no empirical link to reality. But since the Fed has no other model, they cling desperately to it, like a drowning man to a bit of driftwood. Basically, the theory says that when employment is close to being as full, as it is right now, wage inflation is right around the corner. According to the Phillips curve, then, the FOMC needs to be tightening monetary policy. Later we’ll see how the FOMC’s faulty tool is likely to lead to a major monetary policy error. Basically, the Federal Reserve looks at history and tries to conjure models of future economic performance based on it – even as everyone in the financial industry goes on intoning that past performance is not indicative of future results. But all the Fed has is history, and they cling to it. My contention is that the near future is not going to look like the near or the distant past, and so we had better throw out our historical analogies and start thinking outside the box. Now let’s look at some real problems that will impact the future of employment. Last month I shared in Outside the Box a new McKinsey report on job automation. Actually, I shared an Axios article summarizing that report, which is 160 pages long. You can read it here if you have time. McKinsey does a good job pulling together data and forecasting its consequences. Every year, reports like this reflect a process that’s occurred many times in human history. People discover or invent something useful: fire, the wheel, iron, gunpowder, coal, oil, the steam engine, electricity, the automobile, the airplane, the computer, etc. Life changes as the new knowledge spreads. People either adapt or they don’t. Those who don’t adapt fade into the background. In the last few decades of their working lives, they end up taking the very lowliest of jobs in order to get some food, clothing, and shelter; but it’s not a comfortable life. There was no government safety net for most of our history. But most people tried hard to adapt their skills to the new changes. And as we adapted to radically disruptive inventions like the steam engine, automobile, and computer, hardly anyone had the necessary skills, and so everyone had to learn. Today, things are different. Fifteen percent of men between the ages of 25 and 54 – who should be in their most productive years of contributing to their families and society – don’t even want a job. That’s up from 5% in the mid-’60s, and the number has been steadily rising. Fifty-six percent of these people receive federal disability payments, averaging about $13,000, which is roughly equivalent to the pay for a minimum-wage job, after taxes – except that disability comes with free Medicare. Unless these people find ways to develop needed skills, there is not much financial incentive for them to look for jobs. The rest of the people who don’t want jobs are mostly early retirees, homemakers, caregivers, or students. And roughly 1/3 of the 10 million+ men who have dropped out of the workforce have criminal records, which is often a barrier to work. Only about 3–4% are actually discouraged workers who might take a job if a job is available. That picture should be worrying. It is one reason why GDP has not increased all that much. Remember that GDP is proportional to the number of workers available times their productivity. Taking 10 million workers out of the workforce reduces GDP. The problem for most of us now is that we don’t want to simply fade into the background like so many people have done with each major shift in technology; yet new knowledge spreads around the globe now in seconds instead of centuries. It’s easy to feel that the walls are closing in, because for many of us they are. The McKinsey report makes that crystal clear. They project that technology will replace as many as 800 million workers worldwide by 2030. Displacement is not just a US or developed-world phenomenon; it will show up in the emerging and developing markets as well. McKinsey draws a distinction that we should all remember. The problem is less about jobs disappearing than about the automation of particular tasks that are part of our jobs. In most cases, employers can’t simply fire a human, plug in a robot, and accomplish all the same things at the same or better performance level but lower cost. You have to zoom in closer and look at the tasks that each job entails, and ask which of them can be automated. The roughneck jobs in the oilfield are a good example: The Iron Roughneck doesn’t replace all workers on the rig, just some of them. So when McKinsey says that 23% of US “current work activity hours” will be automated by 2030, that’s not the same as saying 23% of jobs. The shift will affect almost all jobs to some degree. That 23% figure is their “midpoint” scenario, too. In the “rapid” scenario it’s 44% of US current work activity hours that will be handed over to machines. The circles on the right are the translation of those task-hours into numbers of workers. 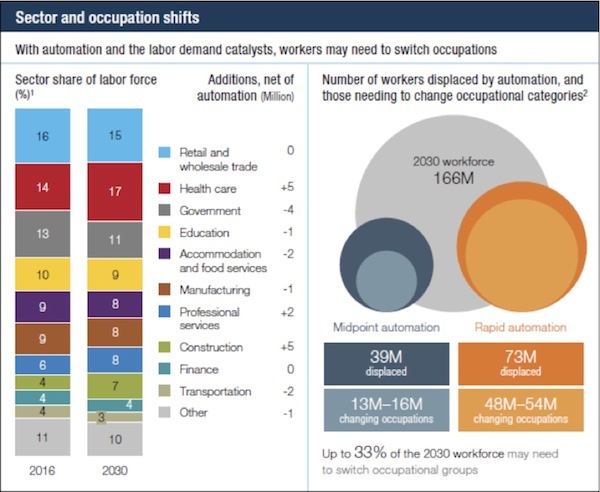 As you can see, in their rapid automation scenario, by 2030 – just 12 years from now – 73 million people out of a workforce of 166 million will have been displaced, with 48–54 million of them needing to change occupations completely. In other words, a full third of the workforce may have to change career fields. That’s going to be a problem. Yes, Americans change jobs more frequently now than they used to, but the changes tend to be evolutionary: We gain new skills, find a better place to apply them, acquire new contacts, seek out new opportunities, and so on. The personal transformation happens slowly enough to be manageable. That’s going to change. This chart demonstrates that it’s not just the low-skilled workers who are at risk. It’s also mid-level and even some high-level people. There is more job risk than many of us imagine. That is why I break the world up into the Unprotected, the Protected, and the Vulnerable Protected classes. The latter group doesn’t even realize their vulnerability. Worse, I think the shift to automation may come even faster than McKinsey’s rapid scenario suggests. Recently I ran across an artificial intelligence story that’s almost terrifying. 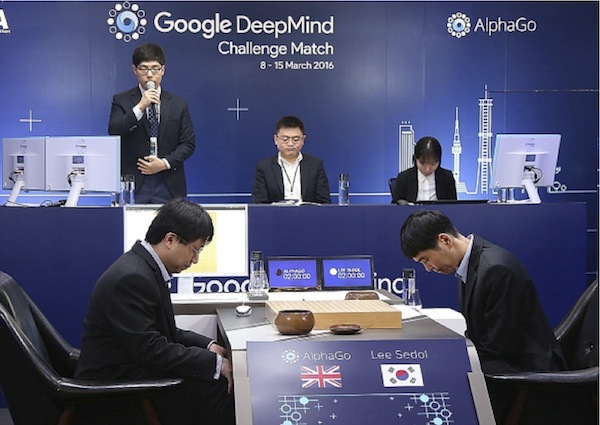 You might have heard about AlphaGo, the AI system created by Google subsidiary DeepMind. It plays the very complex board game called Go. In 2015, DeepMind became the first computer to beat a human professional Go player. It learned how to do this by analyzing many thousands of games played by humans. Impressive, but only the beginning. The most striking thing is that we don’t need any human data anymore. It gets more unnerving. On December 5 (yes, last week), DeepMind published a scientific paper that sounds straight out of science fiction. The AlphaGo Zero program recently achieved superhuman performance in the game of Go, by tabula rasa reinforcement learning from games of self-play. In this paper, we generalise this approach into a single AlphaZero algorithm that can achieve, tabula rasa, superhuman performance in many challenging domains. That’s startling, so let me repeat it slowly. In one day, starting from nothing at all (“tabula rasa”), AlphaGo Zero learned to play chess, shogi, and Go at a superhuman level, beating the same systems that had beaten the best humans in the world. That’s how fast the technology is evolving. I suspect some of the rapid acceleration came from faster processor chips – Moore’s law says they should double in power every two years. But this was far more than a doubling; this was exponential. Systems like that are coming for your job. So if you think you’re safe because you aren’t an assembly-line worker or a retail cashier and don’t work at the level of rote repetition, you could be wrong. These systems will only get better and take on ever more complex jobs. Could DeepMind build a system that reads my archives, monitors my email, and then writes Thoughts from the Frontline at a level where you couldn’t tell the difference between it and me? Those who control the tech are intent on bringing the era of superautomation forward as fast as possible. I talk a lot about incentives and the way people and businesses respond to them. Identifying incentives is a key tool in analyzing trends and forecasting what different players will do next. Well, between dicey Federal Reserve policies and possible tax reforms, businesses are getting new incentives to automate sooner rather than later. First, the Fed. I’ve made the case before that I think they waited too long to end quantitative easing and begin normalizing interest rates. Their delay created our present weird situation where we have little or no inflation according to the indexes, but the cost of living for people at the median income level and below is outpacing wage growth and leaving the average household struggling to stay even. 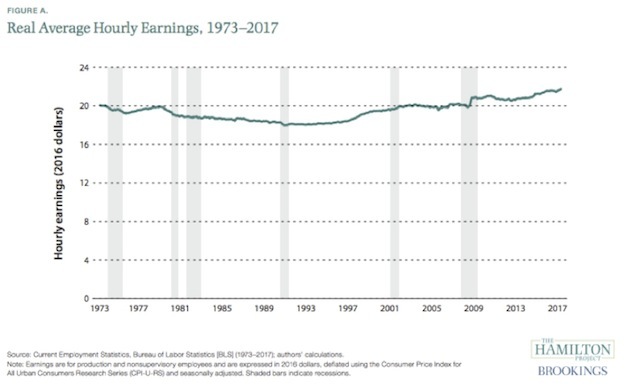 Real wages, that is wages after CPI growth, have advanced only 0.2% a year since 1973. And as I noted above, real wage growth is now decelerating. Of course, there’s absolutely nothing wrong with making your business more efficient. You have to survive against the competition. But in this case the competition is not happening naturally or according to market forces. The Fed has kept market forces from working and has created an environment that would never have occurred otherwise. You can argue whether a laissez faire market would have worked better or worse, but it’s pretty clear we haven’t had one. Now add in tax policy. I explained early this year in my open letters to the new US president that we would all be better off with a consumption tax like a VAT rather than we are currently with the income tax. Alas, I did not get my wish. Congress is right now “improving” the tax code in ways that may actually accelerate the automation trend. For instance, one proposal is to allow equipment purchases to be expensed immediately instead of amortized over time. That’s not a bad idea on its own. However, it effectively subsidizes companies to upgrade their equipment and technology to the latest state of the art. And, as we saw above, the state of the art is automated devices that need little human help. The accelerated shift to automation may help explain a Business Roundtable survey that showed some odd results. As reported by the Wall Street Journal last week, CEOs say their plans for capital investment have risen to the highest level since the second quarter of 2011. That’s good news: Businesses see growth opportunities and want to add production capacity to meet them. But the same survey shows CEO hiring expectations going in the opposite direction. Hiring is not plummeting by any means, and many do plan to increase hiring over the next six months; but the majority say they will keep their headcount where it is or lower it. General Electric will cut 12,000 jobs from its power business, roughly 18% of that division’s total employment, in order to cut costs and reduce overcapacity. How do we explain a situation in which capital spending rises but employment stay the same or falls? Automation is one answer. It lets you increase capacity without increasing headcount and expenses – you may even reduce them. Not coincidentally, the new tax bill may remove the Obamacare individual mandate, but the employer mandate is staying in place – and healthcare costs are still rising. That too incentivizes businesses to use machines instead of people wherever possible. So where do all these factors leave human workers? The McKinsey forecasts fall more or less at the midpoint of those in other reports I am reading. We’re facing a perfect storm: Technological, monetary, and political entities are joining forces to stir up a maelstrom of change that is going to bombard all of us. I’m not an exception, and neither are you. We can’t control these giant forces, but we can control our responses. Whatever your job is now, you need to think about how vulnerable it may be and what else you might do. If you need to acquire new skills, start doing it now. If you have young adult or teen children, help them with their education and career choices. That art history degree may not be much in demand in 2030. Or even in 2020. Looking ahead brings us full circle, right back to considering the potential for a major monetary policy error. We may, in fact, see a little wage inflation in the near future, and I think that would be a good thing, considering how little there has been for years; but right now the Personal Consumption Expenditures Index (PCE) is hovering around annual growth of 1.5%, still well below the Fed’s target of 2%. What would be the danger of letting it rise to 2.5%? Seriously. This FOMC gives every indication that they are not only going to continue to raise rates but are also going to reduce the Fed’s balance sheet by some $450 billion next year. The Fed thinks QE helped to bring about the rising asset prices (stocks, bonds, and housing – assets of all types). Yet somehow they believe that quantitative tightening (QT) won’t have any effect on the markets. Of course, there is no empirical evidence for that conclusion, unless you want to count the taper tantrum that was unleashed when interest rate increases and quantitative tightening were first mentioned. The Fed, with their slavish fetish for the Phillips Curve, see wage inflation just around the corner, and they want to head it off at the pass. But if they are as data-dependent as they say they are, they should look at their data and see that there is no wage inflation. There is a reason why there isn’t: The vast bulk of workers do not have pricing power. The labor market has changed dramatically in the last 20 years, and every study I have read as I have researched the future of work suggests that employment is going to change even more drastically in the next 20 years. If we have 20 million workers who presumably want to have jobs but suddenly find themselves without job opportunities because of automation and other forces, that is not an environment in which we are going to see wage inflation. That is a situation in which workers will take whatever wages they can get. Think Greece. Monetary growth is decelerating, too. The velocity of money continues to fall. Total consumer debt as a percentage of disposable income is the highest it has ever been – over 26%. The savings rate has fallen to a 10-year low. Consumers are stretched, and there is just not the buying power – no matter how low interest rates are – to create the inflation that the Fed is so afraid of. I could go on and on about the fragility of this economy, even though on the surface it seems to be the strongest it has been since the Great Recession. Looking ahead, 2018 should be another year for growth. So I look around and ask, what could endanger that? I think the biggest risk is a central bank policy error. We are going into unknown territory. Beyond this point, there be dragons. I should add that I am generally optimistic about 2018. My forecast issues this year will probably be more optimistic than they have been for a long time. Not necessarily in terms of stock market prices, but regarding the economy in general. I actually have this hope – which I recognize is not a strategy – that the Federal Reserve will back off sooner rather than later and we can avoid a downturn in the economy for another few years. I think nothing could make me happier than if we actually established the record for the longest recovery. Other than a brief trip here and there – and who knows what will slip into the schedule – I will be home for most of December. Shane and I will be in Hong Kong for the Bank of America Merrill Lynch conference in the first week in January January. That trip will be made even more fun because Lacy Hunt and his wife JK will be there with us. We are going to take an extra day or two and be tourists. I’ve been to Hong Kong many times but have never really gotten out of the business district. The last time I was there Peter church house and his son Tama took us to lunch and then on a sailing expedition through the harbor of Hong Kong. He even let Shane and me take turns at the wheel, so we could pretend to be sailors. We have a picture to prove it! One thing I will be doing in Hong Kong is getting some new dress shirts. My workouts the past year or so have focused a lot more on my shoulders and shrugs, and I have actually added a full inch to my neck size. I have literally only one shirt that I can (barely) button to be able to wear a tie with. I have been waiting for the Hong Kong trip, because you can get a custom shirt made in just a few days, remarkably cheaply. I’m not sure that will mean I’ll be wearing more ties, but at least I’ll be able to do so comfortably when the need arises. It has been a busy last few months. I am launching new businesses, and of course that takes time. But amazing new opportunities have presented themselves, and I’m in the process of establishing new relationships that will significantly improve my ability to serve the investment advisor community, not just here but all around the world. We are also working on some exciting new newsletters built around the resources and networks that I have compiled over the years. There is a wealth of information out there that we can bring to you that will significantly improve your ability not just to access and manage your investments but to get in control of your life. Putting all these new business relationships in place takes a team, especially management, which is not my forte. Identifying the people that can take these visions of the future and turn them into realities has been a challenge, but now all the pieces are in place and the engine is revving up. I look forward to being able to serve you in the New Year in brand-new ways. And as a personal request, I would like to hear your ideas on what I should be writing about in my weekly letters. I really do value your feedback and ideas. And with that, I will hit the send button. You have a great week! Here’s a statistic that tells you much of what you need to know about the US trade debate — only 1 per cent of US companies export. It’s a figure that I uncovered recently in a McKinsey Global Institute report on the state of US manufacturing, which confirmed much of what my own reporting has informed me about US trade problems. They begin at home, not abroad. That is not a line you will hear over the next few days, as negotiators meet in Mexico for the latest round of North American Free Trade Agreement talks. The Trump administration is likely to point fingers and threaten again to pull out of the whole agreement. But if the White House wants to fix trade, it would do better to look at three crucial mistakes that have been made at home — and then compare them with opposite strategies in China, the world’s biggest manufacturing country. The first mistake was to starve manufacturing of investment. Private sector investment in the sector in the US is at 30-year lows; the ages of the average factory and piece of machinery are 25 and nine years, respectively. The McKinsey Global Institute report estimates that about $115bn of investment would be required annually over the next decade to fix this problem. But trade and tax policy in the US does almost nothing to provide an incentive for that investment. Companies talk a good game about repatriation, but privately admit that the bulk of any money brought home will go into share buybacks and dividend payments. Gary Cohn, President Donald Trump’s economic adviser, last week appeared surprised (or perhaps feigned surprise) as three hands went up when, at a conference, chief executives were asked how many would invest at home if tax reform were passed. Why should they, when there are no quid pro quos of repatriation in exchange for equipment investment, training or the funding of an infrastructure bank? As the past two decades have shown, supply side economics alone does not result in a productive use of capital, particularly when it comes to global multinationals; sometimes, you have to push investment to the areas where it is needed. That’s exactly what China is doing with its $1tn infrastructure investment plan. Second, the US trade debate has focused far too much on the largest domestic companies, which are doing quite well, in terms of share price, profit margins and sales growth. Yet the vast majority of the 250,000 manufacturing groups in the US employ fewer than 100 people. The current zero-sum game global trade debate hardly applies to them at all. Most do not export, not because they cannot but because access to capital has been tighter for them relative to their rich country peers since the Great Recession (that lack of investment creates a 40 per cent productivity gap between small and large businesses). Reconnecting the dots between the largest exporters and the supply chain could fix that. Regionalisation is the new globalisation — the largest firms in the US should be given explicit government incentives to work with local suppliers, which would do much to address the president’s trade deficit obsession, since 70-80 per cent of the value of a finished product is in the supply chain. Again, this is something that China has prioritised in its 2025 development plan, which states explicitly that the country wants to minimise dependence on foreign markets and technologies. Finally, the US desperately needs to connect Silicon Valley and the rust belt. High-tech manufacturing — 3D printing, the internet of things, sensors in products that create business opportunities in data analytics and services, rather than just goods — may well be the future. Yet, shockingly, roughly half of US manufacturing companies have no digital strategy whatsoever, according to an MGI survey. 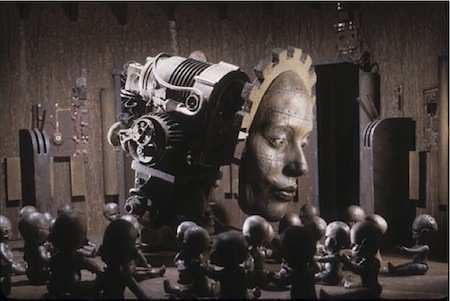 Meanwhile, the technocrats in the Chinese Communist party are giving speeches about the integration of the physical and digital worlds that would leave many people in US boardrooms scratching their heads. Of course, it’s easier to do economic-dot connecting in an autocracy. No one is arguing for that, but it does speak to the core problem — the Trump administration is trying to push “America First” without any clear and coherent plan of what that means, or how to make an industrial strategy succeed. “You look at the current trade debate and you just think, ‘What a lost opportunity’,” says MGI director James Manyika. The countries that the US left behind when the administration pulled out of the Trans-Pacific Partnership — high-growth emerging market nations with expanding middle classes that are engaged in major infrastructure building works — are exactly those with the largest demand for the US’s most valuable exports, such as high-tech products, pharmaceuticals and heavy machinery. Pulling out of Nafta, particularly without any kind of homegrown industrial policy, would be an equally big mistake. Economic nationalism with no economic plan will not make America great again. In fact, it may be worse than the laissez-faire alternative. Before we begin, I’d like to offer a hearty thanks to the thousands of you who responded to the survey we issued last week. If you haven’t responded yet, don’t worry – there’s still time. The goal of the survey is to figure out what you, the readers, want to read. At the end of the month, we’ll produce a video series addressing the top three topics you have chosen. You can access the survey and let us know what’s on your mind by clicking here. Thank you in advance for your time and your thoughtfulness, and to those of you celebrating in the US or in the world, Happy Thanksgiving. Though the frontrunners are becoming clear, there are several other subjects many of you have expressed interest in that we don’t want to ignore. One of these topics is the US economy. Specifically, some of you wanted us to analyze the economy in the context of George’s forecast in “The Next 100 Years”: that a major economic and social crisis revolving around the decline of the American middle class will happen sometime in the early to mid-2020s. In truth, we had planned to dive into this subject before we even issued the survey. For all the optimism surrounding low unemployment rates and record-high real median income, there are some signs that something is rotten in the US economy. This isn’t wholly surprising – economic health tends to be cyclical, and the US is due for a recession. But when the next recession comes, there’s reason to believe it won’t be business as usual. The structural problems that led to the 2008 financial crisis haven’t been fixed. If anything, they’ve gotten worse. In January, we forecast that the signs of just such a recession would emerge by the end of the year. And emerge they have. The yield curve between short-term and long-term US Treasuries is the flattest it has been at any point in the past 10 years. One of my colleagues, Xander Snyder, wrote an excellent piece last week on this very subject, and I encourage you to familiarize yourselves with it if you have not already done so. A flattening yield curve, as he points out, is a problem in its own right, as is a declining prime-age labor force unable to secure adequate wages. But there are other longer-term forces at work that threaten to make what should be a minor cyclical recession a much more painful and prolonged affair. The two most consequential of these forces are increases in total household debt and the continued growth of wealth inequality within the US economy. Household debt in the United States is now almost $13 trillion. That figure exceeds total household debt at any point during or in the recovery period after the 2008 financial crisis. Housing debt has creeped back to pre-2008 levels. 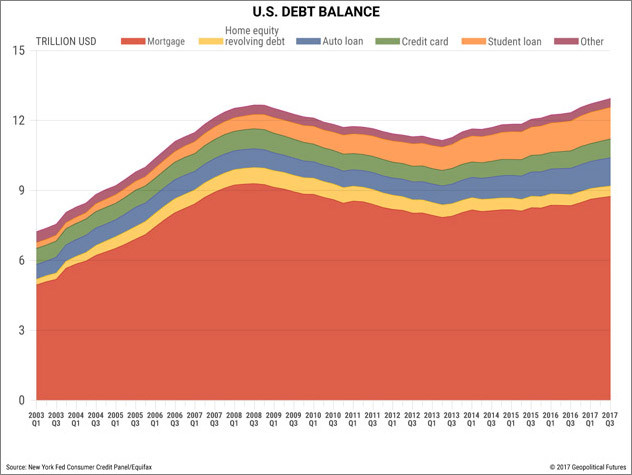 Credit card debt has reached pre-2008 levels too. Student loan debt has skyrocketed by 134 percent since the first quarter of 2008 (about 9 percent on average per year). Increased household debt, though, doesn’t mean the end is nigh; it just means people are borrowing more money. 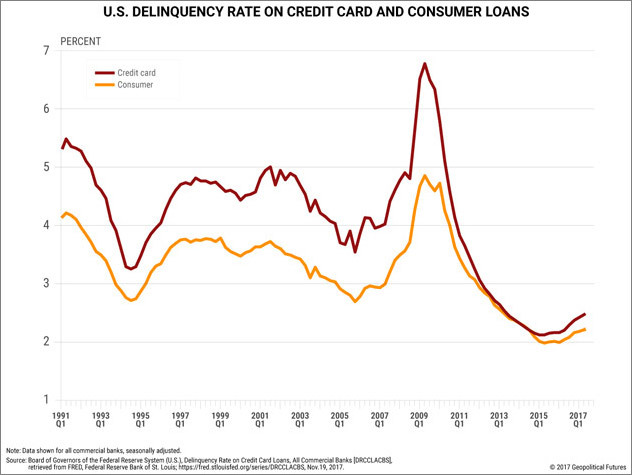 Still, problems arise when people default on credit card and consumer loans. In the second quarter of 2017, the delinquency rate on credit card loans was 2.47 percent and on consumer loans was 2.21 percent. Low though these rates may be, they are trending upward. Last month, shares of JPMorgan Chase and Citigroup fell on the news that both banks had increased their reserves for consumer loan losses – just under $300 million for JPMorgan Chase and just under $500 million for Citigroup. Put simply, American consumers are beginning to spend beyond their means. More serious than higher household debt, though, is increased income and wealth inequality in the United States since the 1970s. In 2015, the top 10 percent of all US earners accounted for just under 49 percent of total income – a share greater than at any time during the Great Depression. The top 1 percent accounted for 20 percent of total income. This kind of disparity is a refrain in US economic history. It characterized the Gilded Age of the late 19th century as well as the decade or so before the Great Depression. Both were eras of immense wealth generation that benefited only the top, and both were rampant with speculation – the railroads and oil in the Gilded Age, the stock market in the Roaring Twenties. Today’s inequality is statistically more pronounced than during both of those times in history. Wealth inequality was already increasing before the 2008 financial crisis, but what happened in 2008 has exacerbated the problem. According to the Pew Research Center, only upper income families have recouped the wealth they lost during the financial crisis. Median wealth was roughly 40 percent lower for lower-income families in 2016 than it was in 2007. It was roughly 33 percent lower for middle-income families. 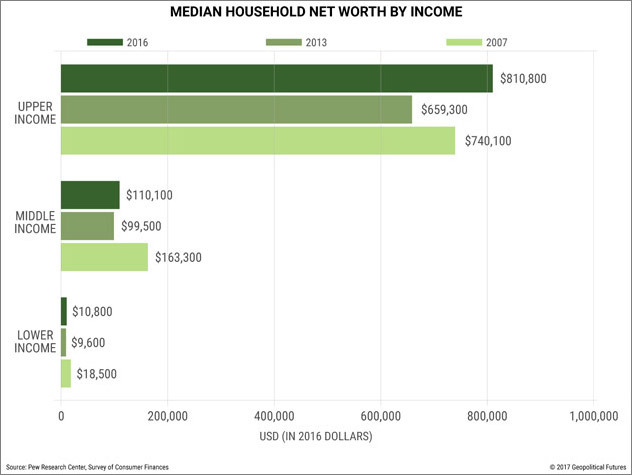 The median wealth for upper-income families, however, grew by 10 percent. The US economy may have recovered in terms of top-line figures, but middle- and lower-income families have not. For those hardest hit, the tales of recovery ring hollow. If that is the case, then how is it that real median income – one of the most important economic indicators we use to assess the health of the US economy – is so high? When we first forecast the coming crisis of the American middle class in 2011, median household income, adjusted for inflation, was lower than it was in 1989 or in 2000. 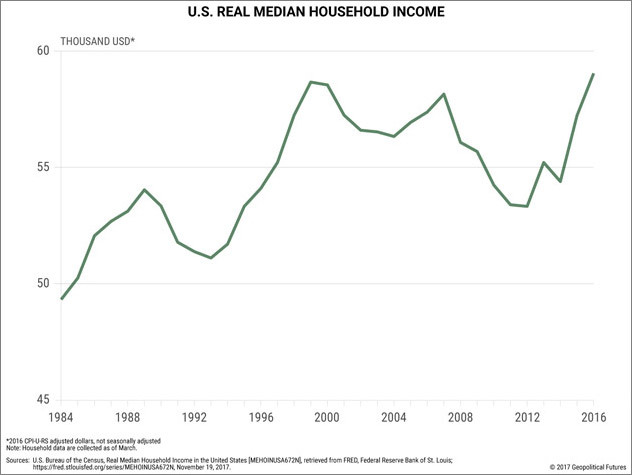 The subsequent rise in real median income is a sign that the middle class has stabilized, right? Well, not really. Real median income can rise even as the gap between those above and below the median widens. 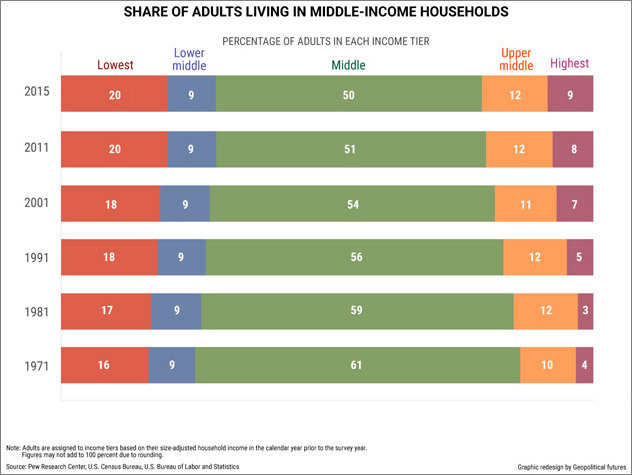 For example, the share of adults living in middle-income households has fallen since 1970. That year, 61 percent of adults lived in a middle-income household. In 2015, that number had fallen to 50 percent. The share of those living in a low-income household increased by 4 percent, and the share of those living in an upper-income household increased by 7 percent. 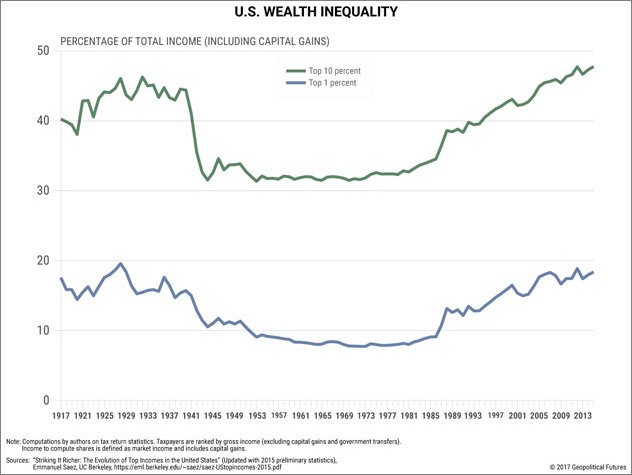 The underlying problem is wealth inequality, and real median income does not necessarily capture wealth inequality. And in 2017, real median income doesn’t go nearly as far as it used to. In the 1950s, the median cost of a home was a little more than double a family’s average annual income. A car was just under half of a family’s average annual income, according to data from the US Census Bureau and the US Department of Commerce. Today, it costs an average family about four times its average income to buy a house, and almost two-thirds its annual income to buy a car. A majority of households in the 1950s, moreover, were single-income households. By the end of that decade, the husband was the sole income generator for 70 percent of American households. Analysis performed by Pew in 2015, based on the last US census, estimated that in 2012, 60 percent of American households were dual-income households. The purchasing power of the real median income has decreased even as US households have added a second breadwinner to the home. For the past 40 years in the US, the rich have been getting richer, the poor have been getting poorer, and the middle class has been disappearing. The crisis of 2008 was a global phenomenon, but in the US, it was also an episode in an era of increasing inequality that began in the 1970s. The American dream was never about just making ends meet – it was about social mobility and giving your children a better life than you had growing up. That is beyond the means of an increasing number of US households. When the next recession comes, it will come as inequality reaches new heights, and if US history is any indication, that will translate into massive political change. Eachquarter, Credit Bubble Bulletin’s Doug Noland posts a “flow of funds” report that analyzes the debt and securities markets data released by the Fed in its Z.1 Report. It’s always shocking to see the numbers we’re dealing with, but even more so lately as history’s biggest financial bubble starts to dwarf its predecessors. This puts Total (Debt & Equities) Securities up $1.400 TN during the quarter to a record $86.080 TN. Total Securities inflated $7.003 TN, or 9.1%, over the past year. Total Securities experienced cycle tops of $55.261 TN during Q3 2007 and $36.017 TN to end March 2000. Total Securities ended Q3 2017 at a record 441% of GDP. This outshines the previous cycle peaks of 379% for Q3 2007 and 359% at Q1 2000. One more way to look at post-crisis securities market inflation: Total Securities ended Q3 $30.819 TN, or 56%, higher than the previous cycle peak in Q3 2007. To sum up Noland’s analysis, the US, along with the rest of the world, has entered full Ponzi, where credit has to continue to rise at unprecedented rates to keep the system from imploding. But the more credit we take on, the more fragile the system becomes. A sudden decline in equities or bonds, geopolitical tensions escalating, cryptocurrencies threatening fiat currencies, you name it, can crack the façade of normality that rising asset prices create. ANOTHER week, another record. The repeated surge of share prices on Wall Street is getting monotonous. The Dow Jones Industrial Average has passed another milestone—24,000—and the more statistically robust S&P 500 index is up by 17% so far this year. 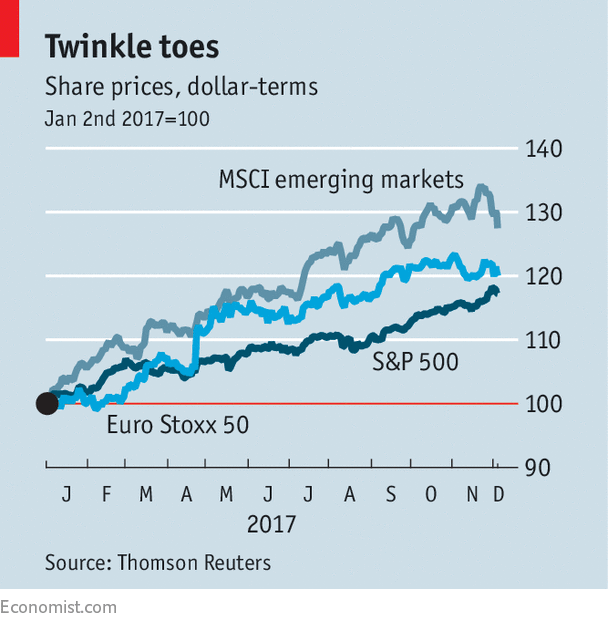 Emerging markets have performed even better, as have European shares in dollar terms (see chart). Political worries about trade disputes, the potential for war with North Korea and the repeated upheavals in President Donald Trump’s White House: all have caused only temporary setbacks to investors’ confidence. No wonder the latest quarterly report of the Bank for International Settlements asked whether markets are complacent, noting that “according to traditional valuation gauges that take a long-term view, some stockmarkets did look frothy”, and pointing out that “some froth was also present in corporate-credit markets”. The authors of the BIS report are not the only ones to worry that markets look expensive. The most recent survey of fund managers by Bank of America Merrill Lynch found that a net 48% of them thought equities were overvalued, a record high. Despite that, a net 49% of managers had a higher than normal allocation to stockmarkets. How do fund managers rationalise this apparent discrepancy? First, they are more optimistic than usual about the economy, with a record number believing in a “Goldilocks scenario” of above-average growth and below-average inflation. Second, investors are even more worried about bonds, the other main asset class; a net 81% think bonds are overvalued. In short, they are piling into shares because they see no alternative. Improving economic data have driven the most recent spurt of enthusiasm. Alan Ruskin of Deutsche Bank points out that, in the manufacturing sector, South Africa is the only country where the purchasing managers’ index is below 50—the dividing line between expansion and contraction. Another boost is the expectation that America’s Congress will pass a bill that will cut taxes for corporations, allowing them to pass more cash to shareholders. Confidence was also lifted by a decent third-quarter results season, which showed that companies in the S&P 500 managed annual earnings-per-share growth of 8.5%, according to Société Générale, a French bank. But long-term profits expectations are “ridiculously high”, says BCA Research, an advisory firm, with earnings forecast to grow at 14% a year in both America and Europe. That would imply an ever-greater share of GDP going to profits, and an ever-lower share for workers. If that were to happen, support for populist parties would go through the roof. Analysts rarely tend to forecast falls in profits. But Andrew Smithers of Smithers & Co, a consultancy, points out that the earnings per share of quoted companies have become far more volatile since 1992, compared with the volatility of profits in the national accounts. One reason for this is the much greater importance of foreign profits in the figures reported by US-quoted companies; the overseas portion rose from 18% in 1982 to 38% in 2015. Even allowing for this, reported profits are more volatile than they used to be. Mr Smithers argues that it is in the interests of managers to present higher profits when share prices rise and to understate profits in bear markets. In the former case, higher profits will allow executives to meet targets and exercise their lucrative share options. Conversely, in a bear market, it is worth managers taking a “kitchen-sink” approach—getting all the bad news out of the way so the next set of performance targets will start from a lower base. Share buy-backs add another factor to the equation. Companies tend to be trend-followers rather than bargain-hunters when purchasing their own shares. Since early 2005, the only two quarters when corporations have not been net buyers were the second and third quarters of 2009. That was the period when valuations were cheapest. All this suggests that there is a risk that when the market does at last turn down, the decline will be exaggerated. Share buy-backs will stop and profits will decline sharply. But judging when that moment comes is another matter. While the economy is improving and interest rates are low, it is hard to foresee the next downturn. As one fund manager says, investors feel like Chuck Prince, a former head of Citigroup, who was asked why the bank was still lending in mid-2007, just before the financial crisis. “As long as the music is playing, you’ve got to get up and dance,” he said. The silence at El Romero is deceptive. Broken only by the ambient hum of transformers and with almost no humans in sight, there is nevertheless plenty going on beneath the surface of the giant solar panels that cover 280 hectares of the arid mountain landscape of northern Chile. About 200 megawatts per hour pulse from Latin America’s largest solar power station into nearby transmission lines that stretch more than 600km south to the capital Santiago from its location in the Atacama Desert, one of the driest and sunniest places on earth. “This is the face of the future of Chile,” says José Ignacio Escobar, general manager in Latin America for Spain’s Acciona, which built and operates El Romero. “Chile may be poor in old energy, but it is very rich in renewables. Can you see a single cloud?” he asks, gesturing towards the indigo sky that is so clear that the world’s most powerful telescopes are built in the Atacama. It is only recently that Chile began to harvest the formidable power of the Atacama’s sun. Just five years ago, the country produced negligible amounts of renewable energy and was heavily dependent on imports from its unreliable neighbours, suffering from blackouts and some of the highest energy prices in the world. But this shortage of fossil fuels has stimulated an unprecedented boom in investment in renewable — and especially solar — energy since then, despite a contraction in investment in almost all other sectors during a period of economic stagnation at the end of the commodities boom. “It’s the great silent revolution of [Michelle] Bachelet’s government, which she will be remembered for later,” says Eugenio Tironi, a sociologist, referring to Chile’s outgoing president who will be succeeded by the winner of presidential elections on December 17. Although the rapid introduction of renewable energy in Chile using market incentives is arguably Ms Bachelet’s greatest achievement, the leftist leader has preferred to trumpet reforms at the core of her agenda that are widely criticised for being poorly designed and implemented, and stifling investment. “The hallmark of our government is the reforms aimed at reducing inequality. Most of the debate has been around education and labour reforms, but if we hadn’t solved [our energy] problem, it would have been more difficult to implement the social reforms,” says Andrés Rebolledo, energy minister, who claims that energy is no longer a barrier to growth. After introducing regulations that opened up Chile’s oligopolistic energy sector to competition, it only took until October this year for the government to reach its target of generating 20 per cent of electricity with renewable sources by 2025, mostly with solar and wind power. It is a measure of how far Chile has come that the pledges by candidates in the presidential election campaign for the country to produce 100 per cent renewable energy by 2040 were taken seriously, and considered feasible by experts. “I don’t think anyone thought [that Chile’s transformation to renewables] would happen so quickly — and it happened without subsidies as they don’t believe in market intervention here,” says Bart Doyle, who runs the operations in Chile for the Irish company Mainstream. “It was a straight fight between renewables and everything else. Not only did renewables win, but they won hands down,” he adds, pointing out that most other countries provide incentives to companies generating electricity through renewable sources. Although Chile’s energy auctions to supply the grid are open to all companies on equal terms, thanks to improving technology and Chile’s renewables potential, they are able to produce solar energy at about half the cost of coal-fired power stations. This was made possible by perhaps the most effective regulatory change under Ms Bachelet’s government, which was to divide the day into thirds, making solar power especially competitive for companies bidding to provide energy in the middle third during only daylight hours. In Chile energy costs have fallen 75 per cent since auctions began three years ago, with the latest producing the second-lowest bid in the world for solar power of 2.148 cents per kilowatt hour. But prices have fallen so low that Mr Doyle warns of the “bleeding edge” of cutting edge technology, arguing that companies may get caught out by bidding below the cost of production. What are the classic signs of an overheated market? Theories are as legion as the horde of Wall Street analysts hawking them, but the most obvious—amply illustrated by the furor over Bitcoin—is a tendency for investors to adamantly ignore evidence that all may not be well. Commodity markets today bear some worrying similarities to this state of mind. In particular, investors are focused on two positive developments: forced factory closures in China, which are driving metal prices higher, and better growth in the U.S. Two big questions, meanwhile, have received far less attention. First: can China’s campaign against small and polluting metal furnaces keep boosting prices even though the real-estate market, the ultimate driver of demand, is now clearly in retreat? Copper and Chinese steel prices are both up roughly 20% since early June. Sales of residential floor space have moved from growing nearly 10% to falling 9% on the year over the same period. That would be less worrying if capacity curbs were truly deep and broad. But they are not: output cuts of 10% or less have been matched by outsize price reactions in both coal and steel, says economist Chen Long at Gavekal Dragonomics. Capacity cuts beginning in early 2016 happened to coincide with a big pickup in real estate. But if the current pollution-related crackdown on industry eases this spring, just as construction activity really starts to slow, metal investors will experience the flip-side of this dynamic. Second: why are commodity inventories in the U.S. so stubbornly high, even though the growth picture is brightening? Oil inventories, which looked like they were poised to finally drain this summer, are starting to creep up again, and have now risen in three of the past four weeks according to U.S. Energy Information Administration data. 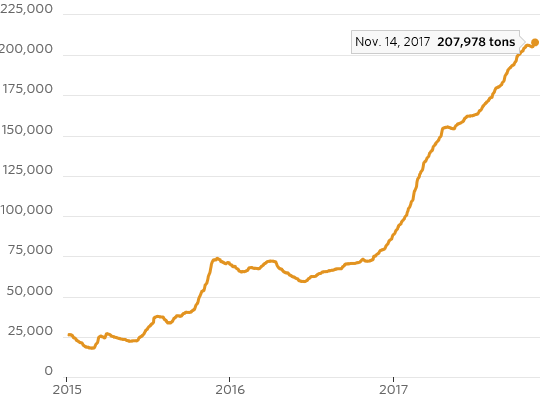 Meanwhile U.S. copper inventories have more than doubled since Trump’s election and now stand at their highest level in more than a decade—in part, perhaps, in anticipation of an infrastructure stimulus or trade restrictions that have failed to materialize. Big falls in Chinese stocks have offset this and allowed prices to move higher. 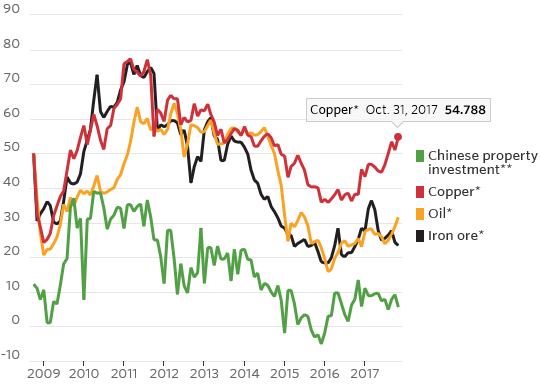 But if inventories start rising again in China too as growth slows, traders may start to wonder why prices are so high if all that copper is just piling up in warehouses. Given the sharp fall in mining investment since 2012 and still-strong global growth, a commodity bloodbath is unlikely. But by the same token, it isn’t clear why commodities should be testing current levels when the biggest consumer is slowing and copper and oil are piling up in tanks and warehouses in the second biggest. If commodities are going to keep charging ahead, these questions need a satisfactory answer. Otherwise, the mild selloff in recent days could be a prelude to a more substantial correction in the months ahead—and investors might start to look askance at all those richly valued growth stocks too.